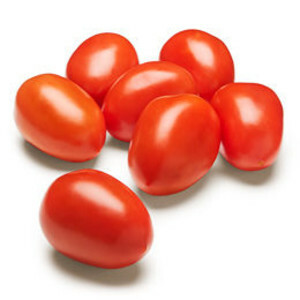 Also known Italian tomatoes; this tomato variety is smaller but versatile and sturdy. Plum tomatoes are often referred to as sauce tomatoes because they have dense, flavorful flesh and contain less water and fewer seeds than standard tomatoes. However, plum tomatoes are versatile and sturdy, and can be used in any preparation. Two popular varieties of plum tomatoes are Roma and San Marzano. Plum tomatoes have a relatively long peak season running from summer through early fall. If you're looking to enjoy plum tomatoes out-of-season, canned plum tomatoes are commonly available and make a good substitute in pasta sauces, chilis, and more. As with all tomatoes, plum tomatoes should be stored at room temperature in a dry environment- chill and moisture will turn them mushy. Plum tomatoes are a good source of the antioxident lycopene as well as Vitamin C. Well-ripened plum tomatoes are a powerhouse of flavor that's equal parts sweet and earthy.